The ability to stand up while learning is a great option, however sometimes it is necessary to sit for a minute. 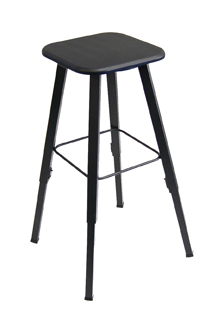 These adjustable stools are perfect for just that. The height can be changed to the proper height of the individual and their desk. Built with the same attention to durability and stability as the AlphaBetter™ desks, these stools are their perfect companion. Uniquely designed to be tip-resistant at all height settings; the leg base increases in proportion to leg height. Height: Adjustable from 21" to 35.5"